We live in a world made by science. How and when did this happen? This book tells the story of the extraordinary intellectual and cultural revolution that gave birth to modern science, and mounts a major challenge to the prevailing orthodoxy of its history. Birds of the Middle East, 2nd ed. The third volume in the bestselling physics series cracks open Einstein's special relativity and field theory. 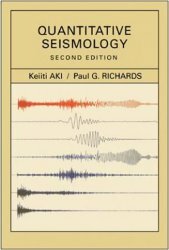 This new edition of the classic text by Aki and Richards has at last been updated throughout to systematically explain key concepts in seismology. Now in one volume, the book provides a unified treatment of seismological methods that will be of use to advanced students, seismologists, and scientists and engineers working in all areas of seismology.